Edmund Gunter (1581-1626) was an English mathematician and astronomer. He was known as the inventor of mathematical instruments and a forerummer of the slide rule. 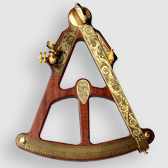 The legendary Quadrant of Gunter is a universal high-quality instrument, which is used not only to determine the time, but also perform extensive astronomical calculations. 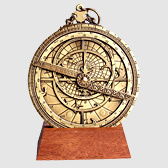 These include, for example, the Sun´s midday, azimuth and declination of the Sun, solar position of the zodiac, sunrise and sunset, latitude and more.